BBQ Sausage-Stuffed Grilled Jalapenos. 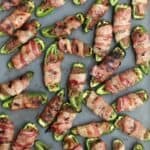 Sweet and tangy barbecue sauce and sausage stuffing, stuffed in spicy delicious jalapenos, then wrapped in bacon and grilled. Kick up your next tailgate, your next summer party, your next gathering with this fun and tasty nibble. Ummm …yeah. So these. Man food. Football food. 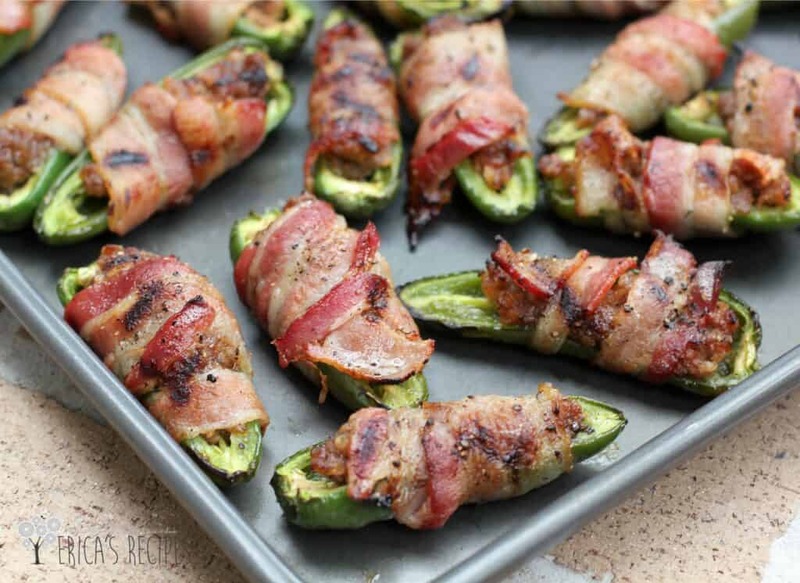 BBQ Sausage-Stuffed Grilled Jalapenos. These would be directly from the splurgy side of my brain. …See, I live in constant conflict – I loooove food. I obsess about food. But at the same time I really do want to be fit and healthy. This is why I can’t do all healthy all the time and I can’t let myself go all unchecked either. Because I would eat bacon every day if I could. Bacon. Jalapenos. Holy perfect combo, right? I love stuffed jalapenos – there’s always that air of danger when you eat stuffed jalapenos. You pick one up …is it going to mildly spicy? or inferno? …without knowing, you risk it all and pop it in. Either way, you’re happy. I have stuffed jalapenos with sausage, with cheese, even shrimp, but this is the first time I’ve grilled them. This was clearly an oversight on my part that I have now rectified. And the result – charred smokey bacon, yummy sausage, sweet barbecue sauce – oh my, oh my, oh my! And just look at them – perfect for a summer gathering, pool party, football party, tailgating, you name it. Aweseome yummy smoky grub for the win. BBQ Sausage-Stuffed Grilled Jalapenos. 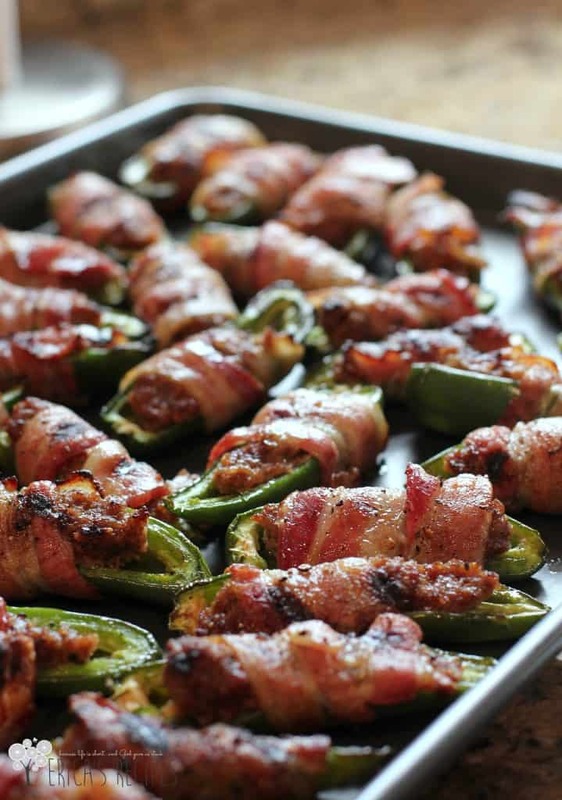 Sweet and tangy barbecue sauce and sausage stuffing, stuffed in spicy delicious jalapenos, then wrapped in bacon and grilled. In a bowl, stir together the sausage, panko crumbs, and bbq sauce. Spoon roughly a tablespoon of the sausage mixture into each jalapeno half. 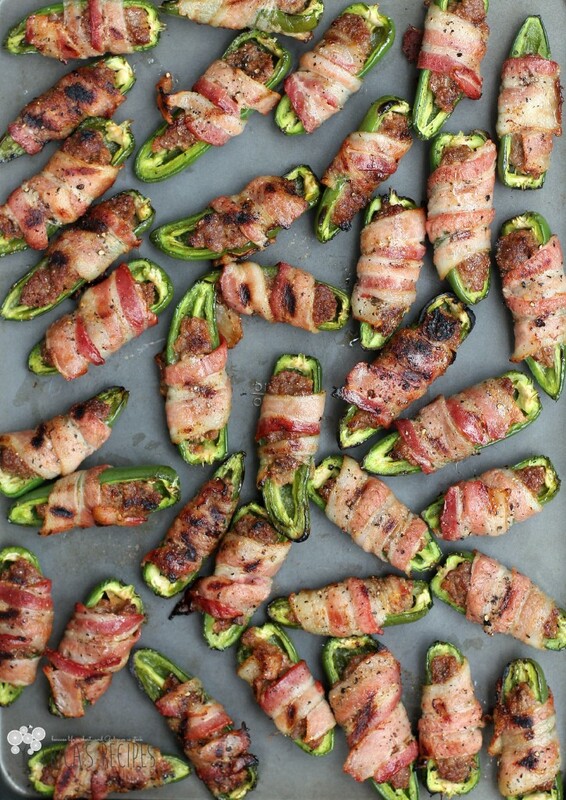 Wrap each in half a strip of bacon. Place on a ventilated grill or broiling pan. Sprinkle fresh cracked pepper over top of the wrapped peppers. Heat grill to high heat. Put in the grill pan on indirect heat (meaning, turn off the burners directly under the peppers). Cook 20 minutes until and stuffing is cooked through and bacon is starting to crisp. During this time, watch the grill temperature to keep it ~375-400F, turning on the direct burners under the peppers occasionally if necessary to maintain temperature. Using thongs, gently turn each pepper over onto the grill grate over direct heat, top side down - this will drain off the fat from the sausage and crisp the tops of the bacon and peppers. Grill another minute or two until they are a little charred and awesome. Yield: 36 appetizers. oh wow! I am SO trying this when my moms garden has jalepenos this summer. amazing! pinned and stumbled! Saw the photo on Let’s Get Real Friday Party! Just the look of them makes me hungry. I will try these soon! Erica these are so wonderfully, sinfully awesome to behold! I want these SO BADLY I can just taste them! I can see these being a serious hit at a party. Thanks for bringing them to foodie friday. pinned. Thanks for coming and linking up at #TheWeekendSocial. Please be sure to come back next week starting Thursdays at 9PM EST on http://mccallumsshamrockpatch.wordpress.com/ ! I hope to see you there! We really enjoyed reading your blog and can not wait to see what you stun us with next! Like you, I enjoy being healthy, though I also like having a treat every once in a while, and if left unchecked, I’d eat bacon daily, too, soooooo this treat sounds like the perfect kind of appetizer. I LOVE that you cooked it on the grill, too! Also, this was one of my favorite recipes from last week’s That’s Fresh Friday Link-Up! Sharing it on my blog tonight, and hoping you’ll come share another gorgeous dish. Keep up the great work! OMG!! You hit a soft spot! Please say yes when I propose to you!! Yum these sound so great! They would be perfect for a dinner party!